The HE Act will end state protection for Academic Freedom – would VW emissions data be public if scientists could be threatened? The HE Bill was passed in a modified form in a pre-election negotiation between the political parties in June 2017. It is now an Act. Although we failed to stop the Bill from being passed, the public awareness and scrutiny of the Bill has blunted some powers, on paper at least. 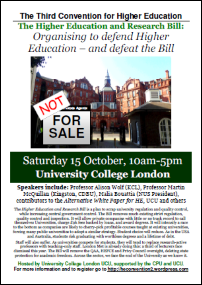 The campaign to defend Higher Education from market madness must continue. 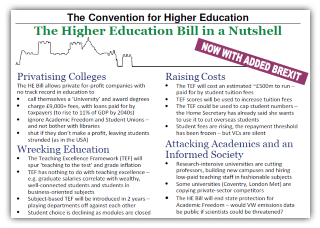 The HE Bill (Act) is the most recent in a sequence of damaging changes to the way the UK Higher Education sector is funded. The ‘Willets Plan’ started with the introduction of £9,000 undergraduate tuition fees and new student loans, and the removal of direct funding for many subjects in 2011. It was intensified with the removal of limits on undergraduate recruitment in 2014. This encouraged universities to expand in direct competition with each other. The HE Act now allows companies with no track record in higher education to enter this market. We published a detailed critique of this process in The Alternative White Paper for Higher Education. The arguments in this short book are as relevant now as they have ever been. As existing universities direct their efforts to this new market in undergraduates there will be new flashpoints. The latest of these is the attack on the pensions of staff in the ‘old’ universities.